On February 9, 1964 The Beatles made their first live U.S. television appearance on The Ed Sullivan Show. Within days Beatlemania spread like wildfire across the country. 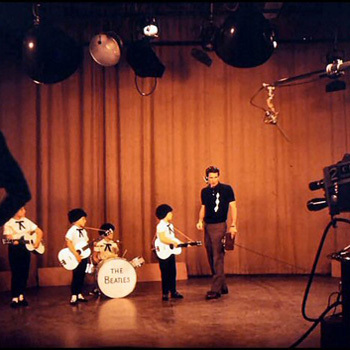 Never one to miss a trend, Poopdeck Paul Schultz hosted weekly Beatle contests on his TV show. Boys, girls, parents, puppets and combinations thereof all lip synched live to the latest Beatles hit single. One of the cutest versions of the Beatles on the show were four little ladies named Cindy, Debbie, Ann and Cathy. Some forty plus years later, Cynthia Zwick recalls her fifteen minutes of fame on CKLW-TV with Poopdeck Paul. 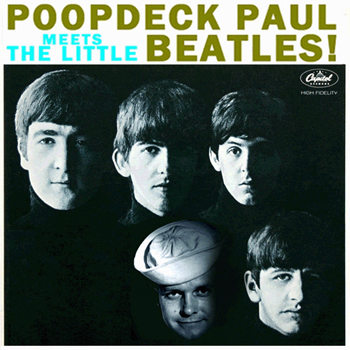 In 1964 the Poopdeck Paul show was holding a Beatles Mimicking contest. Most of the contestants were teenagers, but we were 7 and 8 years old. My mom sent in 14 post cards trying to get us on the show. One day I came home from school and she said that the contest was over, but they called from the show and wanted us to be “special guests”. I ran to the front door and saw that Ann’s mom had told her too. Then Debbie came home from school and found out. But we were missing a Ringo, so we ran and got Cathy because her brother had drums. My dad did the lettering for the drums, we got our wigs and outfits, and that weekend off we went to Channel 9 in Windsor, Canada. We choose to sing Misery from Introducing the Beatles. The customs officer had fun with us because we had our wigs on already. I was John, Debbie was George, Ann was Paul and Cathy was Ringo. We appear in the photos from right to left with Ringo on drums, of course. When we arrived at the studio they took us right to the back stage area. We were standing next to a 6-foot-tall Bosco character. They asked us some general questions and took the record from us to cue. We watched three teen-age girls sing a song, then they said stay tuned for special guests after a Popeye cartoon. During the cartoon they took us out on the stage and set us up. The sound guy had me talk to test the sound. Then Poopdeck Paul came out and asked if we were nervous. He was very kind, as I remember. They counted down, then Poopdeck Paul began interviewing us. He had too many questions and kept kidding around, wanting us to sing another song, but we did our number then. Afterwards, he gave us a newsletter from the show and autographs and, I think, Zagnut bars. I would have liked Bosco better. I carry these photos on my I-pod and have fun showing them to people. It was a great experience!